It seems to me that if all of us employed what little wealth and power we have towards shaping the world to embrace true freedom and liberty, then together we could make great strides in creating better life for all humanity. 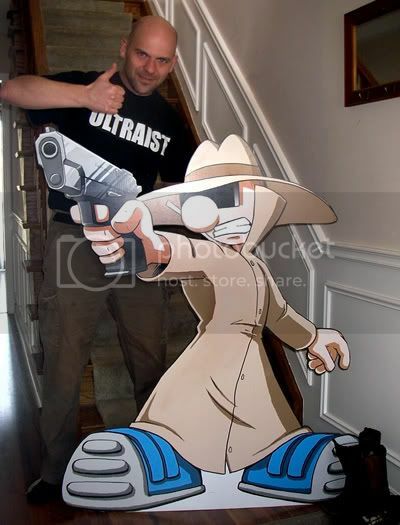 Last October when Hawley Anderson contacted us on behalf of Dimension Films for comics, product, and signage to use in the upcoming feature film called SUPER HERO, I got the idea to create a life sized cut-out of SPY GUY. The following documents the “creative process”. Originally I was going to use existing artwork (due to time constraints) however there wasn’t anything in existence that matched what I envisioned in my head – so it was back to the drawing board. In a last minute rush, I hacked out this sharpie sketch. I’ve started using sharpie markers to force myself to commit to a gesture rather than endlessly chicken scratching with pencil. Next I used the Dave Sim tracing paper method to pull an actual drawing out of my sharpie sketch. I find that drawing on the mirror image helps to quickly tighten up the drawing, and then enables an easy transfer to the S-172 Bainbridge. Once the pencils are transfered, the inking process begins, using primarily a Hunt 102 nib and a Windsor Newton #2 (not to mention some form of white out). At this point I scan the artwork into the computer, and in this case I realized that I had drawn SPY GUY’s head too small. D’oh! For a moment I thought about redrawing the whole thing, however instead opted to just scale the thing in Photoshop. Then I added some colour (doing my best to ape the Anime cell animation style) and voila! I had a final image. This was then sent off to the fine folks at The Lot to be turned into a life sized cut out. Here is the final product! Look for it in the background of the SUPER HERO movie coming soon to a theater near you!